An unaltered photocopy of your DD-214, WD AGO, ERB/ORB or other military issued document clearly displaying your U.S. Army Corps of Engineer primary or secondary MOS. Branch Insignia: A gold color triple turreted castle eleven-sixteenth inch in height. The triple turreted castle has been in use by the Corps of Engineers since it was adopted in 1840. Prior to that time an insignia of a similar design was worn on the uniforms of the Corps of Cadets of the United States Military Academy since the Academy was under the supervision and direction of the Chief of Engineers. Selection of the turreted castle as the Engineer insignia followed the first major construction undertaken by the Corps of Engineers--the building of a system of castle-like fortifications for the protection of harbors along the Atlantic Coast. These fortifications, many of which are still standing, were in fact called "castles". 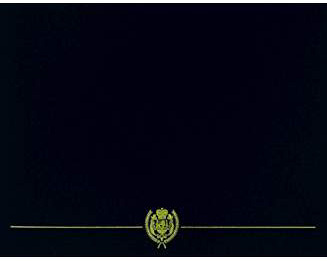 By 1924, the insignia had involved into its current design and color (gold). Branch Plaque: The plaque design has the branch insignia and border in gold and the letters are white. The background is scarlet. Regimental Insignia: A silver color metal and enamel device 1 1/16 inches in height consisting of a scarlet shield with silver border and gold castle at center and attached below a scarlet scroll inscribed "ESSAYONS" in silver. The regimental insignia was approved on 11 April 1986. Regimental Coat of Arms: The coat of arms appears on the breast of a displayed eagle on the regimental flag. The coat of arms is: Gules, within a diminished bordure Argent a castle affronte, Or. The background of the flag is scarlet and the fringe is white. The motto "ESSAYONS" is on the scroll at the eagle's beak and the scroll below the eagle has the designation "CORPS OF ENGINEERS". Symbolism of Regimental Insignia: Scarlet and white are the colors of the Corps of Engineers. The castle and the motto "ESSAYONS" traditionally have been associated with the Corps. Branch Colors: Scarlet piped with white. Scarlet - 65006 cloth; 67111 yarn; PMS 200. White - 65005 cloth; 67101 yarn; PMS white. Scarlet and white were established as the Corps of Engineers colors in 1872. Before that date, several other colors had been associated with the Engineers. Birthday: 16 June 1775. Continental Congress authority for a "Chief of Engineer for the Army" dates from 16 June 1775. A Corps of Engineers for the United States was authorized by the Congress on 11 Mar 1779. The Corps of Engineers, as it is known today, came into being on 16 March 1802, when the President was authorized to "organize and establish a Corps of Engineers... that the said Corps...shall be stationed at West Point in the State of New York and shall constitute a Military Academy." 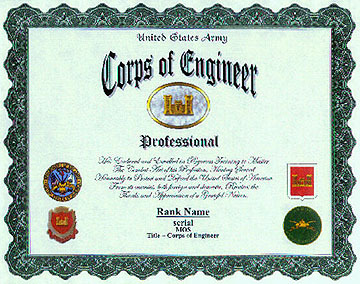 A Corps of Topographical Engineers, authorized on 4 July 1838, was merged with the Corps of Engineers on 3 March 1963.